Rajasthan is better known for its heritage and monuments spread across various districts of the State; a French group ‘Wagon Bleu’ exploring beauty of land that belonging to Maharanas, reached Udaipur today evening. A French group of 20 members ‘Wagon Bleu’ landed in the City of Lakes today evening, on their 11 scooters of 1960’s model. 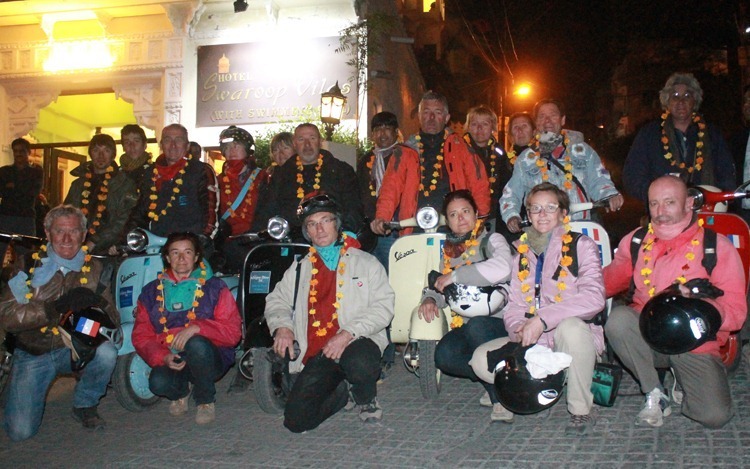 The group flagged-off their journey from Montpilier in France and are on expedition of Rajasthan only, after reaching India the troop started from Delhi on their scooters. All the scooters used in this tour are models of ‘Vespa’ manufactured back in 1960’s and are still maintained by them, Rajasthan has a rich history of Maharanas and their Custodianships is the reason why the group opted this place. ‘Wagon Bleu’ in their tour have visited Jaisalmer, Bikaner, Jodhpur, Mount Abu and Ranthambore travelling with an average run of 200 km per day, the troop is escorted by medical van and mechanics for the security reasons. According to Umar Rehman, Tour Operator, group would be staying in Udaipur till Thursday, and will start on Friday morning to head for Chittorgarh, Umer and Bharatpur would be their last district; thereafter they will go back to Delhi via Agra. Gauthier Gilbert (Tour Leader), Mrs. Bayle Gauthier Marie Jose, Terry Laurent, Marie Louise, Cartoux Bruno, Perrier Use Cartoux Elisabet, Jean Paul, Gazquez Magali, Thoue Pascal, Levene Francoise, Arnac Didier, Schwarz Barbara, Delorme Jacky, Castex Marie Christine, Melle Tocqueville Perrier Emilie, Thackeray Perrier Robin Doucet, Florence Paulet, Castex Sylvie, Blanc Jean Luc and Foulon Jacques together form the ‘Wagon bleu’.